The bones are alive – that is true. Bones are continually rebuilt and do not stop when you are an adult. Bone consists off protein and collagen that collects calcium, phosphorus, magnesium and other minerals. You can also have lead in your bones – if the body can not get rid of it. There are two types of bone cells: osteoblasts which will build new bone and osteoclasts that will break down and also get rid of old bone. Bone ends are made of cartilage – that is a softer type of bone, so that joints can work smoothly. White women above 30 years old will lose 1% of bone mass per year. Osteoporosis is common in women after menopause. Fractures are common in one in three women and one in twelve men by the age of 70. In diagnosing osteoporosis, the following has to be taken into consideration. If a risk factor is present – have a test done. Best test will include hip, lower back vertebrae’s. Another quick test is testing the bone density of the heel – if osteoporosis is present then a complete bone density test is recommended. Check calcium, magnesium and vitamin D levels and other relevant blood parameters. When bone loses calcium, residue is excreted through urine and can be traced with urine test strips. You can test whether you still loose bone mass or not. Low calcium levels cannot necessarily be associated with osteoporosis. Post menopausal African tribes with a very low calcium intake have very low rates of osteoporosis. Blood pH is regulated by sodium and calcium. When the body’s sodium is depleted – then calcium is used to balance the blood pH. Have balanced calcium in diet. Best food sources for calcium: cheese, almonds, brewers yeast, parsley, corn tortillas, globe artichokes, prunes, pumpkin seeds, cooked dried beans, cabbage, yoghurt, soya and supplements. Remember milk is not a good source for calcium because of the calcium and magnesium ratio and it is also loaded with bovine hormones. WW – only sells milk without bovine hormones. 10-20 minutes of sunshine a day (before 10am or after 4pm). If you very seldom get into the sun rather supplement with a calcium supplement that contains vitamin D.
Limit protein intake to a maximum of 15-20% of total energy requirements. Phosphates suppress calcium absorption and enhance bone loss when the calcium: phosphate ratio > 1:1.5. Phosphates are found in fast foods, cool dinks, sugared foods and meat. Meat has a high calcium-phosphate ratio. Phosphates will stimulate the parathyroid and that will enhance bone loss. Post menopausal African tribes follow a low protein diet with a very low calcium intake and they have very low rates of osteoporosis. Eskimos with a high calcium diet have high rates of osteoporosis. The reason behind this is a high protein diet. Protein makes the blood acidic. Blood pH is regulated by sodium and calcium. When the bodies’ sodium is depleted – then calcium is used to balance the pH. You can not balance a high protein diet with a higher calcium intake. We have enough proof now to say that a high protein diet is primarily the cause for osteoporosis. High protein diets (especially high consumption of red meat) make the body acidic and you will lose a lot of calcium from bone to regulate blood pH of 7.4. You can also get protein from tofu, nuts, lentils, sunflower seeds, yoghurt, cottage cheese and fish – these specific proteins will have a less acidic affect on the blood pH. Eat lots of raw food – contain calcium and other minerals. You don’t get cows with osteoporosis – they eat grass and drink water. Ageing causes absorption levels to decrease because of low stomach acid. Citric acid will enhance stomach acidity. Stomach acid levels can also be increased with betaine hydrochloride tablets. Other precautions – shoes with rubber soles, limit alcohol consumption and check your medication for drowsiness. Has to be done annually when osteoporosis has been diagnosed. Low oestrogen after menopause is blamed for osteoporosis. That is a fallacy – because our ancestors have not suffered routinely from a decreased bone density. Oestrogen will not stimulate new bone formation but will merely stop loss of old bone. Progesterone will stimulate new bone formation because of its stimulating affect on osteoblasts. When a woman stops ovulating – no progesterone is released through the ovum, but oestrogen is still released in small quantities. Some scientists now believe that it is because of a progesterone deficiency and not a deficiency in oestrogen that causes osteoporosis. In my opinion it is very seldom that you can pin point one aspect as disease forming – it is normally a few factors. Lifestyle assessment is necessary. Carry out appropriate blood tests for estrogen, progesterone, parathyroid and thyroid. Initiate appropriate treatment and/or lifestyle changes. Electric blankets: the electric current that flows through this blanket, can cause a calcium loss from your bones. Switch off the electric blanket before you get into bed. There is no cure for osteoporosis – you can turn it around or you can stop the degenerative process. Exercise alone is not effective in treating osteoporosis, but it is a very important component. Strong muscles will help to prevent falls. Aquarobics are excellent for osteoporosis patients. Get a bio kineticist, physiotherapist or any other knowledgeable person to assist with your exercise programme. Natural progesterone cream is four times more effective than synthetic oestrogen HRT in restoring bone density – available from your local pharmacy. Calcium is a very important mineral in bone formation, but we have no experimental evidence that high doses of calcium taken over a long period of time will prevent osteoporosis. Calcium by itself cannot build bone because bone consists of various minerals (e.g. magnesium, silicon, fluoride, zinc, copper, boron, manganese and phosphorus) and in the process of bone formation other nutrients and vitamins are required. Deficiency in any of the above may lead to bone loss in spite of adequate calcium intake. The calcium-magnesium ratio is the most important factor in bone health. The calcium-magnesium ratio balance is controlled by the kidneys. The kidneys will excrete either if that balance is disturbed. Magnesium supplementation will improve calcium retention and will not suppress calcium absorption. Magnesium might be more important than calcium in reversing osteoporosis. Magnesium supplementation in a 2-year study with progressing osteoporosis patients there was either an increase in bone density or an arrest of further bone loss in 87% of patients. The majority of osteoporosis patients have a deficiency in magnesium because of western diets. Vitamin K2 plays a major role in keeping calcium in the bones and out of the arteries. Osteocalcin is a protein that is associated with bone formation. When there is a deficiency in vitamin K2 undercarboxylated osteocalcin is formed and you get bone loss from the skeleton and teeth. The same process is reversed with vitamin K supplementation. Vitamin K2 is the only vitamin (hormone) that plays an important role in calcium-controlling gammacarboxylated proteins in the body. Vitamin K2 is a stronger antioxidant then vitamin E or coenzyme Q10. We now know that vitamin D has many other functions apart from just improving mineral absorption. It has a hormone-like action on directing calcium into bone and suppressing parathyroid action. We now know that the osteoporosis patient should have higher doses of vitamin D against a background of maintenance intake of calcium. Bone building with calcium can only take place when adequate quantities of the following are available: zinc, boron, silicon, copper, fluoride, manganese, phosphorus, vitamin D3, magnesium and vitamin K2. The minerals and vitamins have a synergistic effect on calcium assimilation. Vitamin C is very important in the biosynthesis of the matrix proteins in bone. Sufficient quantities of vitamin C are needed for the healthy regeneration of bones. It is clear from our health talk that the calcium only approach is no longer valid. We need all the other vital nutrients for the formation of healthy bones. 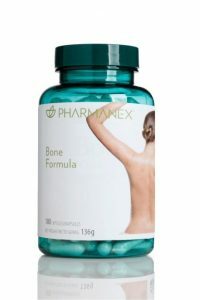 Pharmanex Bone Formula is a complete bone supplement that excels in improving osteoporosis and osteopenia. Is your bone supplement adequate for your osteoporosis? Do you have a bone supplement that can reverse your osteoporosis and osteopenia?